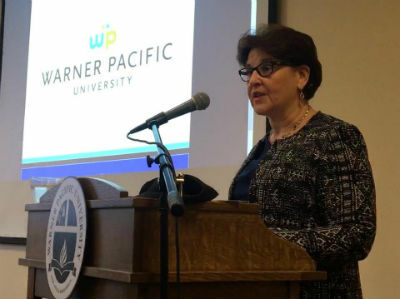 Warner Pacific College in southeast Portland announced a name change to Warner Pacific University, at an event held this morning. The new name more accurately reflects the growth and development that Warner Pacific has experienced in recent years. Additionally, they announced a drastic tuition reduction of 23 percent. The change recognizes increased academic programs at both the undergraduate and graduate level. Becoming Warner Pacific University will also clarify the position of the institution to international students and those whose language of origin is not English, where the word college often refers to high school or secondary level education. Established as Pacific Bible College in 1937 by the Church of God (Anderson, Indiana) in Spokane, Washington, this is not the first major identity change for the institution. The school moved to Portland in 1940 and became Warner Pacific College in 1959. For nearly a decade, Warner Pacific has been recognized for a commitment to diversity in higher education, with 63 percent of students coming from racially and ethnically diverse backgrounds. Warner Pacific University serves undergraduate and graduate students at campuses throughout Portland and southwest Washington, as well as online. The University offers over thirty career-focused majors that prepare students with the confidence and skills they need to use their education to make a difference for their family and their community. Warner Pacific University is reducing tuition by nearly 24 percent starting in the fall of 2018, in an effort to provide equitable access to private higher education, the university announced on Thursday. Tuition and fees for the 2017-18 academic year were $24,500. Beginning in fall semester, tuition and fees will be $18,660, making Warner Pacific the most affordable private college or university in Oregon. Warner Pacific is committed to diversity. 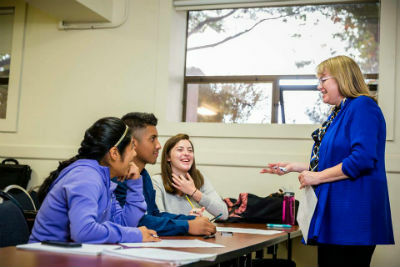 Known for a commitment to equitable access to higher education, Warner Pacific offers a unique learning environment in the state of Oregon, with 63 percent of students coming from racially and ethnically diverse backgrounds. This year, 57 percent of the student body are the first in their families to attend college. Simply put, this nearly $6,000 reduction in tuition means more students will be able to enroll at Warner Pacific and finish their college education while accumulating less debt. The tuition decrease is accompanied by a reconfiguration of financial aid, providing a savings for many new and continuing students, as there will be a reduced reliance of unsubsidized parent loans and private student loans. Reflecting their desire to be “…in the city, for the city,” Warner Pacific has been meeting with leaders throughout Portland in fields of healthcare, technology, criminal justice, and more, in an effort to better understand the workforce needs in this region. In 2018, Warner Pacific is launching new programs that give practical focus to the liberal arts, including medical lab science, nursing, digital media and communications, criminal justice, sports medicine, population health, and gerontology. Master’s level programs in education and business administration will develop leaders in these key fields who will serve with passion and integrity. Learn more about Warner Pacific University at www.warnerpacific.edu. This entry was posted in All Church of God, Colleges & Universities and tagged Andrea Cook, diversity, higher education, name change, OR, Oregon, Portland, reduced, reduction, tuition cut, Warner Pacific College, Warner Pacific University, WPU. Bookmark the permalink.